Tomorrow night Oregon Painting Society and Woolly Mammoth Comes to Dinner will unveil a new performance we're calling "Witch-Angel". 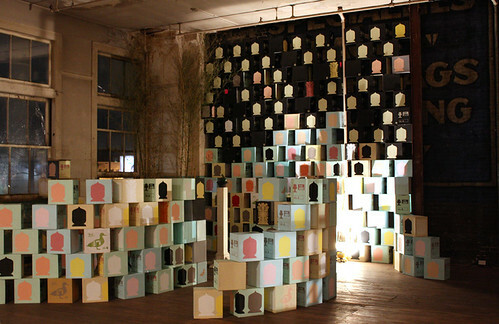 It takes place inside "Hexxenhouse", our contribution to Disjecta's Portland2010 Biennial at the Templeton Building (5 SE 3rd). The performance will be at 9pm. Also, O.P.S. has been invited to go to the Tate Modern in London! We're going to be participating in "No Soul For Sale: A festival of independents" to celebrate the Tate's 10th anniversary. To raise funds for this trip we'll be selling our boxes for $25 a piece after the performance tomorrow night.